Below are online versions of our Interpretive Hiking Trail Brochures. You can walk each trail when you visit the Mary Kahrs Warnell Forest Education Center but, until then, we hope you enjoy our Virtual Versions. They are perfect for a rainy day! The forest was here long before people. It began growing when the ocean that once covered this land retreated and the land dried out. People were not around to see the first forest grow and become a great storehouse of plants, animals, and nutrient rich soil. Activity: Look at the layers in the soil pit. Can you see the difference between the layers when covered by the ocean? When the first forest began growing? The Creek Indians lived in this area long ago, and they used the forest in many ways. The forest provided them with wood for their fires and materials to build homes. To them, the supply of wood and other forest products was nearly endless. Back then, each Native American used about as much wood in one year as these marked trees contain. Activity: Take a look at the labeled plants nearby to find out how Native Americans used the forest. As more people settled in this area, the available forest land got smaller. Early settlers used much more of the forest than Native Americans. They cut more trees to build big houses, burned more firewood, and cut down the forest so they could clear the land for crops. These marked trees show about how much wood each American used during the year 1850. Activity: Compare the number and size of trees used by early settlers with those used by the Creek Indians. Look at the marked trees. These trees represent how much wood each American uses today. You can probably tell it's less wood than used by the Native Americans or the early settlers. Even though we produce more kinds of forest products than ever before, each of us uses a smaller total quantity of forest products than early Americans did. Then why is it so important for us to carefully manage our forests and use forest products wisely? Think about the answer while you walk to the next stop. Activity: Can you list 5 products made from trees? How big is one acre of forest? You don't have to guess. This marked off area is one acre in size . When Columbus discovered America, there were 200 acres of forestland for every Native American. Today, there are only 3 acres of forestland for every American. What happened? The forest got smaller and the number of people got much, much larger. Fifty years from now there will be only 2 acres of forest land for every American. How do we make sure we use our forests to provide the forest products we need while protecting the forest? The answer is, wise forest management. The next few stops will show you how forest managers do just that. Activity: One acre contains 43,560 square feet. How many acres are contained in a football field, 300 feet long and 150 feet wide? Good forest management starts with planting trees. In Georgia alone, 3 billion trees have been planted in the past 10 years. Not just any tree is planted, but trees specially developed by forest scientists to grow faster and healthier than wild pine trees. Activity: The open area before you was planted with improved loblolly pine tree seedlings in 1999. The trees were properly spaced to give each one the right amount of growing room. Can you guess the distance between trees? 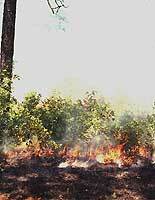 One tool forest managers use is prescribed burning. Prescribed burning means using fire in a controlled way to remove unwanted weeds and shrubs growing below the forest trees. This allows the forest trees to use all the water and nutrients to increase their growth, and prescribed burning reduces the chance of a wildfire getting started. Would Smokey Bear approve? Yes, Smokey approves prescribed fire. Smokey does not like wildfires that burn out of control in the forest. Prescribed burning also creates openings in the forest that allow more food to grow for wildlife. Native Americans knew the benefits of using fire in the forest, and burned the forest regularly. Activity: Compare the burned area here with the surrounding forest. Which area is more likely to have a bad wildfire? When the pine trees growing in front of you are ready to be turned into forest products, they will all be cut at one time and the site will be planted with pine seedlings. This method of harvesting and replanting trees is called "clearcutting." The clearcut system is used in Georgia because we grow so many pine trees. Pine trees can't grow well in the shade. By removing all the trees on a site before planting, clearcuts provide the new pine seedlings with the sunlight they need to grow into a mighty forest that will provide the many forest products that we use. Activity: As you walk through the woods, look at the young trees growing on the forest floor. Where do you see more hardwood seedlings like oaks, in the shade or in the sun? Where do you see more pine seedlings? Can you guess the diameter (thickness) of this pine? If you guessed about 18 inches you are right. Georgia has more acres of valuable pine trees like this one than any other state. That's why forestry is the biggest agricultural business in Georgia, adding $20 billion dollars to our state each year. We owe a lot to trees, and to the many folks who help grow them and turn them into forest products. We're working on getting this to you very soon! Welcome to the Mary Kahrs Warnell Forest Education Center's One Mile Loop Trail. The purpose of this trail is to showcase the diversity of forest types found on the Warnell Forest. You will encounter six different forest types during your walk: a mature pine plantation, an upland mixed hardwood and pine forest, a young pine plantation, a scrub oak forest, a longleaf pine forest and a hardwood bay forest. The two primary reasons different forest types exist are: 1) Changes in basic soil characteristics, including moisture and nutrients, across the landscape and 2) Human land-use patterns, both past and present. Located at several stops along the trail are aerial photos taken periodically between 1938 and 2000. These photos reveal how the forest and the land have changed over time. Studying the photos, you will see how past land-use practices have influenced the forest types that exist here today. Two things characterize a pine plantation: 1) the trees are all of the same pine species and 2) they are planted in evenly spaced rows. Look at the photos in the kiosk. Where this pine plantation is today, agricultural crops were grown in the early 1960's. Today, it is hard to see the rows of planted trees because, over the years, seeds from surrounding loblolly and slash pine trees have fallen, germinated, and grown up between the planted trees. This is one reason why some trees in this stand are taller than others. Look closely at the forest surrounding you. Many natural processes are occurring. The many rotting stumps and fallen logs on the ground around you are the remains of trees that lost the competition for space, water, nutrients and light. As these trees die, fall to the ground and decompose, they make room and provide additional nutrients for the remaining trees. A disease called fusiform rust has infested many of the remaining trees. It causes a canker, or wound, to form on the trunk. This weakens the wood and eventually the tree will break during a strong wind. Something you can't see is the fact that this soil is naturally low in fertility. Combine this fact with several generations of agricultural use and you can understand how the lack of nutrients in the soil has contributed significantly to the relatively poor growing conditions for the surviving trees. Look around. Did you notice that the forest has changed? It changed from a pine plantation to an upland hardwood and pine mixed forest. The primary tree species found in this mixed forest type are live oak, water oak, southern red oak, laurel oak, and slash pine, loblolly pine and longleaf pine. Look at the 1938 aerial photo in the kiosk. Notice the large live oaks and laurel oaks were here as well as some of the larger pines. Therefore, we know that the largest trees here are over 65 years old. However, their exact age has not been determined. Also notice that the forest was much more open. It is possible that the landowner allowed livestock to openly graze this area, which would have kept down the underbrush. Today, the absence of livestock has resulted in the growth of a dense understory of shrubs and vines. You have stepped out of the upland hardwood and pine mixed forest and are now standing at the edge of a loblolly pine plantation. This area was clearcut in the mid-1990's to stop an outbreak of southern pine beetles. The harvested area was replanted with loblolly pine trees in 2000. In order to prepare the site for planting, the debris from the logging operation, including brush, limbs and stumps, were pushed into long narrow rows called windrows. This activity is part of the process referred to as site preparation. This process is an important step when preparing a forest site to be planted with a new crop of pine trees. The windrow itself is a unique environment. It contains soil, rotting stumps, roots and other woody debris. As the woody debris decomposes, nutrients like nitrogen, potassium and phosphorous are released back into the soil to be utilized by the young pine seedlings and other plants growing on the site. In addition to providing nutrients for plant growth, windrows are an ideal habitat for many wildlife species. Notice the blackberries, sumac, grasses and other "pioneer" plant species growing on or near the windrow. These plants provide an abundance of food and cover for wildlife such as small rodents and songbirds. These animals are, in turn, food for snakes, owls, foxes and other predators. The old fencepost in front of you marks the northwest corner of what was once a large crop field. The field is outlined on the 1938 and 2000 photographs on the kiosk in front of you. More than likely, the field was fenced to keep cows, pigs and other livestock out of the cotton and food crops grown here. You may not believe it, but you are standing in the middle of the main "highway" before the present Georgia Highway 17 was built. This road was known as Old Louisville Road. It ran north to Marlow and on to Louisville. Look at the 1938 photo, and you'll see the new Georgia Highway 17 in its present day location. The green-gray reindeer moss growing on the ground in front of you is an indicator of poor soil conditions. Surprisingly, this is not a moss - it is lichen. A lichen is a combination of a fungus and alga. The fungus part of this plant is good at spreading out in the sand to find water and nutrients. The alga part uses the water and nutrients, along with carbon dioxide and energy from the sun, to make food for itself and the fungus. This symbiotic, or mutually beneficial, relationship allows the fungus and the alga to grow together in a place where they could not survive alone. Note: Reindeer moss is extremely fragile! Please do not pick it up or step on it! This intersection is called five-points because it is where 5 trails come together. The main trail turns left here and leads to Stops #8-14 before arriving back at the Education Center. If you like, take a short side trip straight ahead (north) into one of the most unique habitats in Georgia - the longleaf pine sandhill forest type. The longleaf pine sandhills are considered to be the oldest forest type in the Georgia Coastal Plains. Here you will find mature longleaf pines as well as young longleaf pines in various stages of growth. Look for the seedling "grass stage," the rapid growth or "rocket stage," and the lanky "candelabra stage." In addition to the pines, many interesting plants and animals can be found here including Georgia's State Reptile, the endangered gopher tortoise. Note: If you see a gopher tortoise, observe it but please do not touch it! You are walking through the scrub oak forest type now. Notice the turkey oak trees growing in the area. This scrubby tree takes its name from its leaves, which are shaped like a turkey foot. The leaves of the turkey oak have long leaf stems that twist during times of intense heat. This action turns the leaf, angling it away from the hot sun. Doing so helps the tree conserve moisture. Adaptations like this help it survive and grow in the often-harsh environmental conditions found in this part of Georgia. The trail has lead you to the edge of the hardwood bay forest type. This forest type is a peat bog dominated by loblolly bay, sweetbay magnolia and gallberry holly and swamp red bay. Other species include pond pine, fetterbush, titi, wax myrtle and buckwheat tree. While the bay is not often deeply flooded, the soil stays wet enough to prevent it from being used for agriculture or development. Those brave enough to venture into the bay will find many old, large trees and a great many wildlife species. It is interesting to consider that, several thousand years ago, this area was once a tributary of the Ogeechee River. Over time, the river changed course but its presence greatly influenced both the topography, or "lay of the land," and the vegetation that grows here now. On this tapped or "faced" longleaf pine, you can clearly see the diagonal stripes that were made in the tree to encourage pitch production. The tin directed the flow of pitch into a metal box or ceramic cup that hung on the nail. The scrapes were renewed frequently and, in later years, they were treated with sulfuric acid to induce more pitch production. The pitch was gathered once or twice a month and carried out on a mule-drawn wagon. The practice of tapping came to an end years ago due mainly to increased labor costs and competition from foreign markets. For more information on the turpentine industry, see the turpentine display located in the Education Center. The opening in the forest beyond you was created when a tornado passed through. It is being reforested naturally by loblolly pines and several oak species. Natural disasters like tornados and wildfires create openings in the forest. These openings allow sunlight to reach the forest floor, which enables plant species that need lots of sun, like pines and other "pioneer" species, to grow. If you look behind you into the dense forest, you will not see any pine seedlings growing on the shady forest floor. Natural disasters play an extremely important role in the forest ecosystem by increasing the diversity of plant and associated animal communities. Note the large live oak draped in Spanish moss. For many people, these are symbols of the South. However, are you aware that Spanish moss is actually a flowering plant and not a moss? It is not a parasite either. It is an epiphyte. Epiphytes are plants that derive their nutrients from dust in the air. The live oak tree only provides support for the Spanish moss. The live oak is Georgia's State Tree. It served an important role in the early history of the South. In the days of wooden ships, the live oak was the species of choice for shipbuilding. In 1828, the U. S. Navy reserved 30,000 acres of live oak forest on Santa Rosa Island near Pensacola, Florida to ensure an adequate supply of the wood. This was America's first "forest reserve." This small tree is a spruce pine. It is typically found in the Flatwoods forest. Spruce pines generally occur along river systems, as they prefer moist soils. It is of little commercial importance for its wood but it does make a very attractive landscape tree. The red bay tree near by is similar in nature to the spruce pine even though it looks very different. Both trees are evergreen, an adaptation to hot dry summers. Evergreen trees can continue to make and store plant food in the cooler, wetter conditions of winter. Both trees also have leaves designed to conserve moisture. Pine needles have a waxy coating, and bay leaves are leathery to reduce wilting. Interestingly enough, the evergreen habit and drought resistant nature of these trees makes both of them ideal for planting in your yard as a landscape tree. Southern red oak is often confused with turkey oak. To tell them apart, look at the base of the leaves. Southern red oak has a U-shaped base while the turkey oak has a tapered base. Southern red oak wood is commercially used to make furniture and flooring and it also makes an excellent shade tree. As you near the end of the One Mile Loop Trail, think about the various forest types you walked through today. Hopefully, you had a wonderful experience and gained a better understanding of how man and nature contribute to the diversity of forest types found in Georgia. Come again, you're sure to see something new. The forest is always changing.